In August, I was seeing dragonflies everywhere, and I very much wanted to paint one for my giant canvas series. They were so abundant flying over the dusty Gustavus roads that I figured I’d easily find one. But days went by with no luck. I took to inspecting first my truck’s grill, then (surreptitiously) everyone else’s. Nothing. August 14: Clear, sunny, as warm as it has been. …driving toward 4 corners from airport, saw gleam of wings in road, pulled over, went back to pick up. It’s a mosaic darner, still alive, seeming disoriented. I picked it up by folding its wings over its back, the way John does, brought it to the car, put it under my hat in passenger seat. At Glacier Bay Lodge, decided it should have a chance to fly if it was just stunned, so I set it on a boulder and went to dinner. Over an hour later it was still there, so I put it in a plastic container and brought it back to the cabin. Gave it another chance overnight with lid off, then next day (sunny) also with lid off. When I returned it wasn’t moving anymore so I felt OK to bring it in. 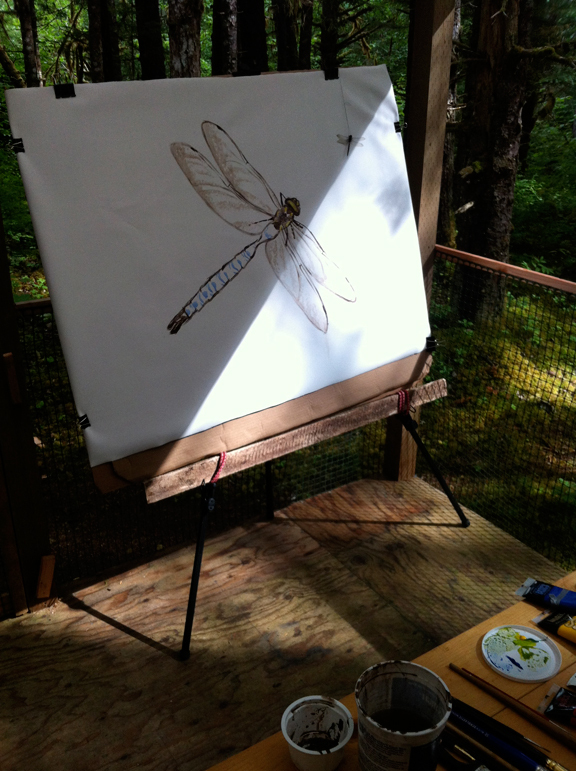 I kept the dragonfly for some time; hung it on a thread next to my canvas. Painted on the porch of the cabin in shafts of sunlight. Added details of eyes and legs and wing veins. This was my first experiment with color—just a touch, showing the blue and green shine on the dragonfly’s head, thorax, and abdomen. Doesn’t seem like enough, so it’s still wordless.